In one of the legends of King Arthur and the Holy Grail, an orphan teenage boy, Percival, stumbles into the woods surrounding the castle at Camelot, sees a swan flying over the trees, and shoots her down with his bow and arrow. Brought before the outraged knights, Percival is told that in this forest all life is sacred. Mortified, he breaks his bow, throws it away, and sets out on his famous quest for the Holy Grail, a mythic cup or stone that will bring renewal and hope to the dying king of Camelot, to a land that's become ravaged by famine, and to a people who have lost their way. Tales about Percival and his adventures were popular in medieval Europe. The foolish boy, made wise through compassion, was a cultural hero for the people of the day. And the story of how he completed his quest and returned to the dying land of Camelot with the key to a better life touched a deep chord. * * * Closer to our own time, 20 years ago in upstate New York, two teenage boys shocked the small town of Manlius by taking a swan from a pond and brutally killing her. Crowds of outraged, anguished people came to the court proceedings. One of the boys even had to be taken out of school for fear that he might be attacked by the crowds. There were also some animal rights people who questioned the town's anger – albeit from another point of view. It was hypocritical, they said, to get so angry about this one incident when we allow the torture and killing of animals by the millions every week in the name of health and beauty and food and fashion. That may be true, but the reactions of the townspeople of Manlius told of something that resonated deep within them. 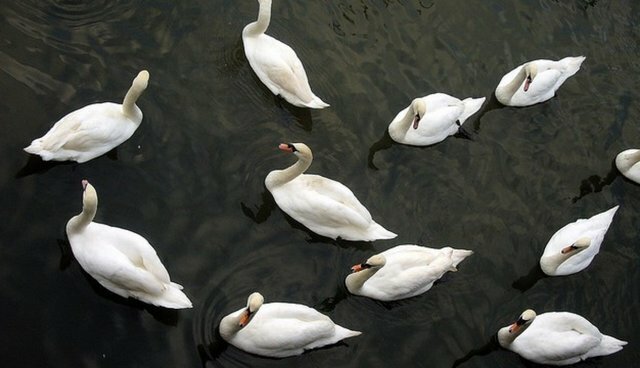 For thousands of years, swans have been a symbol of love. When Percival shoots the swan, he doesn't "just" kill one bird; he kills love itself. The knights aren't upset at his lack of sensitivity or understanding as much as they are at the emptiness of his heart. In the same way, the killing of a swan in a small town in upstate New York told the people that their children were walking around with empty hearts. And an empty heart begets an ear that's deaf to suffering and an eye that's blind to beauty. * * * What, then, can we say of a time, today, when New York's Department of Environmental Conservation is planning to license the killing, by shooting, gassing and beheading, of the state's entire population of 2,200 mute swans? Mute swans, known for the fact that they rarely vocalize, were brought to America from Europe in the 19th century by wealthy people wanting to adorn their estates. For more than 100 years they lived their lives and gave birth to their young as a protected species. But 10 years ago, a coalition of hunters and "conservationists" (often just another word for hunters) began lobbying Congress to remove protections on this "invasive species" who were eating too much underwater vegetation and defending their nests against human visitors (i.e. the hunters). As the plan now moves forward, New Yorkers have until Friday of this week to submit responses. Twenty years ago, the death of a single swan at the hands of two insensitive boys was enough to send a whole town into outrage as a generation of parents struggled to understand how any of their children could be growing up with empty hearts. Today, a state agency is about to open the door to wealthy voters who are deaf to suffering and blind to beauty so they can unleash a "final solution" on whatever gets in the way of their sport of killing. * * * For thousands of years, in every age and culture, people have gone on quests for something special that will heal our ills and restore our world. In times gone by, their searches were often for new and mysterious lands, mythical creatures, or magical stones and elixirs. But for the people who followed the adventures of Percival, the quest was for something more lasting and meaningful that nourished the soul. And for their children it began when they recognized the beauty of a single swan and learned to understand that all life is sacred.